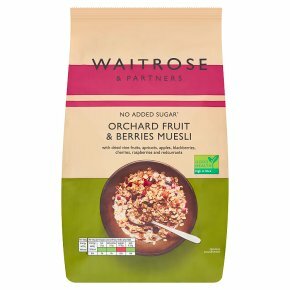 INGREDIENTS: Oats, wheat flakes, sultanas (13%), flame raisins (12%), barley flakes, toasted wheat flakes, DRIED SLICE APPLE (3%) (apples, preservative sulphur dioxide), DRIED APRICOT (3%) (apricot, rice flour, preservative sulphur dioxide), freeze dried raspberries (1%), freeze dried redcurrants (1%), freeze dried blackberries (1%), freeze dried cherry (1%). For allergens, including cereals containing gluten, see ingredients in bold. May contain: peanuts, milk and nuts.